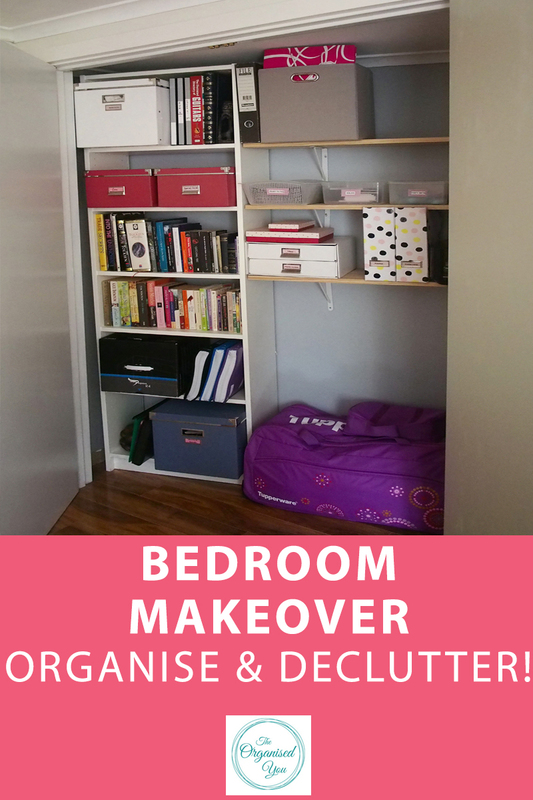 Bedroom Makeover: Organise and declutter! Have you been following along with our bedroom makeover project? If you've missed anything, I shared how we created a new home office area, and did some construction to gain a new storage cupboard as well as some extra space in the room by removing a door. Up to this point, my husband had been doing most of the hard work, but now that was sorting-time, it was finally my turn to step up! Which, for this organising fanatic, was an all-too-welcome job! As I do with every project, everything that we needed to store in this room was pulled out. This way I could sort and declutter before finding a home for each item. You can see how I've done this with client spaces with this wardrobe, with this home office and this sewing room. We are lucky to have a very large master bedroom, so I had lots of space to lay all our belongings out. All items from the home office area needed to be sorted through as well so this took me several afternoons. My sorting piles were 'keep', 'sell', 'donate', and 'throw out'. The first category was the books. We don't have a huge collection of books as we tend to borrow books or read online, but it was still good to purge books that we'll never read again - these went into the 'donate' pile. The rest were stored away in our new storage cupboard. I've always pictured our house having a gorgeous book display, but realistically we just don't have enough books to set this up! The next area I tackled were the Expedits attached to the new desk. I was wishing I had just bought plain white storage boxes instead of the pink and blue, as I find the colours too strong in this room. So I did a bit of swapping around of the contents so the coloured boxes were stored out of sight in the storage cupboard. 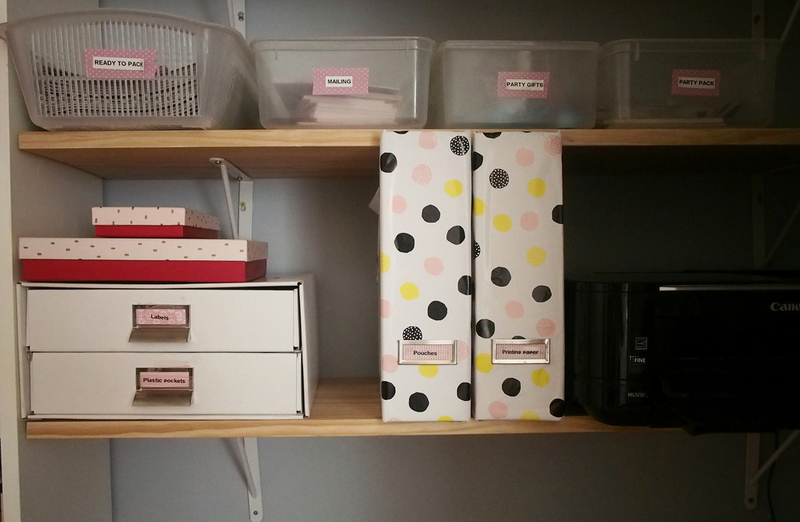 The right side holds my Tupperware-related paraphernalia, printer and paper and labelling products. Bit of a mish-mash, but it's all stuff that I didn't want out on display, so I love having it stored out of sight, but still in an organised way. I love having everything so easy to access. It might not be display-home worthy, but it is colourful, sorted and organised, and that is the main thing that needs to happen behind the closed doors of a cupboard, don't you think? UPDATE: Get a detailed plan of your project happening before you launch in with this free project planner, to help you create your perfect space! Stay tuned next week for the final bedroom reveal, including our amazing storage-packed bed (who knew a bed could have such a function? 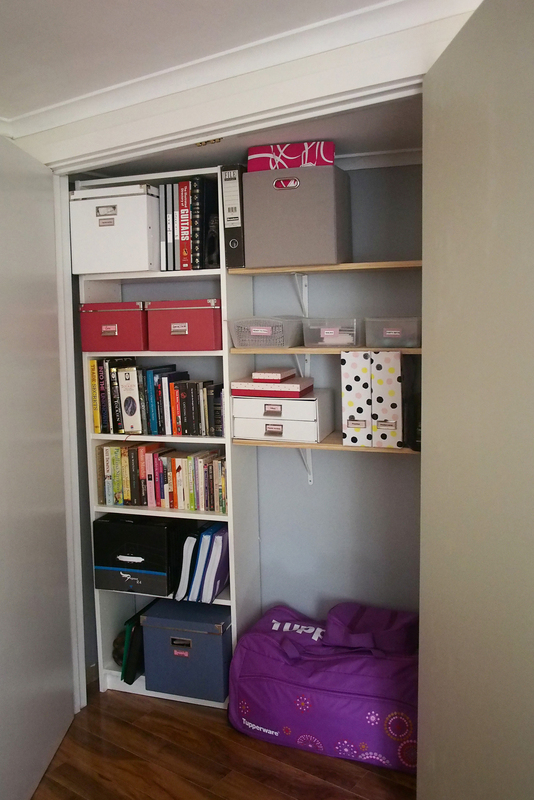 ), new colour scheme, an organised home office area, and clothes-storage switcheroo! I'm excited to share it all with you!